I vividly remember standing in a tiny graveyard high on a hillside overlooking a remote rural town in central Tasmania twenty years ago. The weather-beaten headstones were hard to read, so I was amazed to find a cluster in readable condition, all celebrating the deceased as 'veterans of the Peninsula Wars and of Waterloo'. I quietly wondered what had brought such men to the opposite end of the earth to build new lives. But any regular on this series who has visited Australia and sat in Salamanca Place in Hobart (admiring the view of Mount Wellington), or enjoyed a glass of red in the Barossa Valley near Adelaide, or gone bushwalking in the Arapiles in western Victoria - or even just gone to Brisbane (named of course after one of Picton's brigade commanders) - will no doubt have noticed the frequency of 'Wellingtonian' place-names. For these places were named in honour of a generation of the veterans of Spain, Portugal and Waterloo who had a profound impact on the settlement of Australia in the nineteenth century; the period between the arrival of the Peninsula-hardened 48th Foot in New South Wales in 1817 and the death of the last Peninsula veteran in the colonies in 1879. Wellington's Men in Australia is perhaps the first book to explore the contribution of this generation of veterans (primarily officers) to the Australian colonies. The rapid expansion of the British army in the period 1804 to 1815 provided a career path for many officers - substantial numbers of whom could not otherwise have afforded the price of a first commission - and the reductions after 1815 meant that many were placed on half-pay and looking for other occupation. New South Wales and Van Diemen's Land were then opening up for free settlement, and former officers could acquire land grants and convict labour to work the land. Peninsula veterans were exactly the sort of men the colonies needed; individuals used to a harsher climate and lifestyle, many with surveying, medical, road-making or engineering skills, bringing with them the whiff of command, an air of authority. They also brought with them their social structures and established a sort of colonial old-boy's network that became the nucleus of colonial power - even though many were from middle-class backgrounds back home. Readers will recognise familiar Peninsula officers such as Sir Thomas Brisbane, Thomas Bunbury, Ralph Darling, Henry Dumaresq, Andrew Geils, William Light and Sir Thomas Mitchell within the text as men who were part of this veteran generation; interestingly, such men (and there social cohorts) were also instrumental in the development of colonial religion, art and literature. It was men like these who had significant impact at a time of great colonial expansion, particularly in New South Wales, at a time of transition from a convict colony to free society. The book also includes two excellent appendices; one a database of influential British army officers in the Australian colonies who were veterans of the Peninsular War; and the second being a summary of the colonial careers of Peninsular War veterans. Christine Wright is a visiting fellow at the Australian National University, Canberra. Her book fills a void in the little-known later careers of many eminent Peninsula officers in the colonies. Readers are advised however that they will find little about the activities of these officers during the war itself, and little about 'other ranks'. 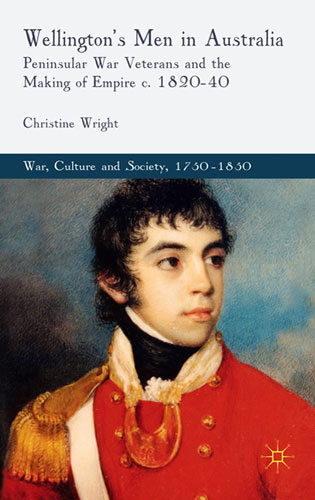 The book is focused on men of influence who transformed the colonies in the period 1820 to 1840, and as such is highly recommended as an important addition to the biographical and social history of both the British Army and of Australia.